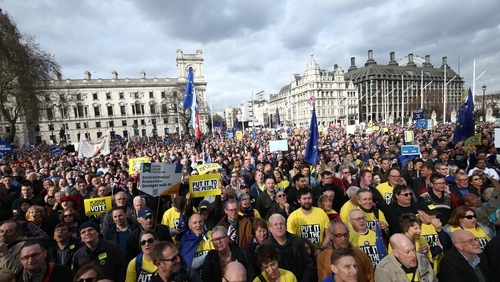 An estimated one million people opposed to Britain's withdrawal from the European Union marched through central London today to demand a new Brexit referendum. Marchers set off in central London earlier today with banners proclaiming "the best deal is no Brexit" and "we demand a People's Vote". Campaign organisers said hundreds of thousands of people were in the crowd as it began to march. A petition to cancel Brexit altogether gained over four million signatures in just three days after British Prime Minister Theresa May told the public "I am on your side" over Brexit and urged MPs to get behind her deal. The march saw protesters process from Park Lane to Parliament Square, where a rally was held. In Parliament Square, Labour's deputy leader Tom Watson told the crowd: "At every turn we have been ignored. "At every stage Theresa May has doubled down rather than reaching out. "The British people didn't vote for the government to gamble on our future, the British people didn't vote for the national nightmare that's been created," he said. "It's time the government gave us, the British people, a final say on Brexit." Scotland's First Minister Nicola Sturgeon told the crowd that Mrs May had pitched "parliament against the people". She also called on Labour leader Jeremy Corbyn to back a "people's vote". Former Ukip leader Nigel Farage re-joined the ‘March to Leave’ when it set off from Linby, near Nottingham. The demonstrations follow EU leaders agreeing to delay Brexit to give Mrs May a final chance to get her deal through Parliament. Leaders agreed to extend Brexit to 22 May if Mrs May can get MPs to back her deal in the Commons at the third time of asking. If the vote is not passed, the UK will have to set out an alternative way forward by 12 April, which could mean a much longer delay - with the UK required to hold elections to the European Parliament - or leaving without a deal at all.